Records and Netflix have teamed up to bring the newest music video from their hugely-anticipated BRIGHT: THE ALBUM into homes this past Thanksgiving Day. 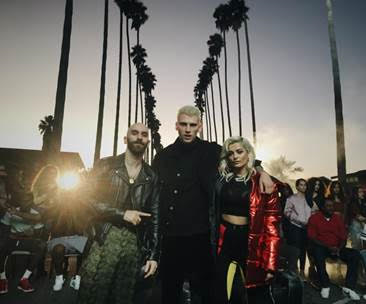 After skyrocketing up charts immediately upon release last week, “Home” by the incomparable trio of Machine Gun Kelly, X Ambassadors & Bebe Rexha, is now accompanied by a heart-warming companion video. Directed by acclaimed Bright director David Ayer, whose film work also includes Fury, Suicide Squad, End of Watch and Training Day, the official video for “Home” makes its debut today on Netflix as part of the anthology BRIGHT: THE MUSIC VIDEOS, which will also feature the previously released hit video “World Gone Mad” by Bastille. 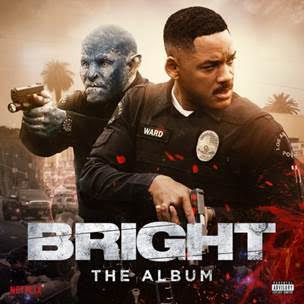 Additional videos from BRIGHT: THE ALBUM will be released in the coming weeks leading up to the launch of the Will Smith and Joel Edgerton action blockbuster film BRIGHT on Friday, December 22nd on Netflix. BRIGHT: THE ALBUM arrives at all music retailers and streaming services on Friday, December 15th. Machine Gun Kelly, X Ambassadors and Bebe Rexha joined David Ayer a few weeks ago to shoot this tailor-made video for “Home” in Downtown Los Angeles, replicating the world of Bright. The video features actual orcs from Bright and follows Machine Gun Kelly through an emotional journey as he returns home after being released from incarceration. Yesterday’s video release of “Home” follows an extremely exciting first week for the single, which shipped to pop and rhythmic radio stations nationwide last Thursday, while climbing charts and getting massive playlist placement across multiple streaming services. “Home” follows the first two tracks released from BRIGHT: THE ALBUM: “World Gone Mad” by Bastille and “Darkside” by Ty Dolla $ign & Future (Feat. Kiiara); the two tracks have amassed over 12 million global streams in the first two weeks. Next out of the gate will be “Broken People” by the team of Logic & Rag’n’Bone Man, arriving worldwide on Thursday, November 30th with an accompanying visual content piece created by the animators of Bright’s opening title sequence. The final song to be released prior to street date is “Danger” by Migos & Marshmello, which will arrive December 7th, joined by the premiere of an action-packed new companion visual featuring never-before-seen footage from Bright.